He was the son of a MetLife manager. The college Marxist wrote his dissertation the history of life insurance in the United States. 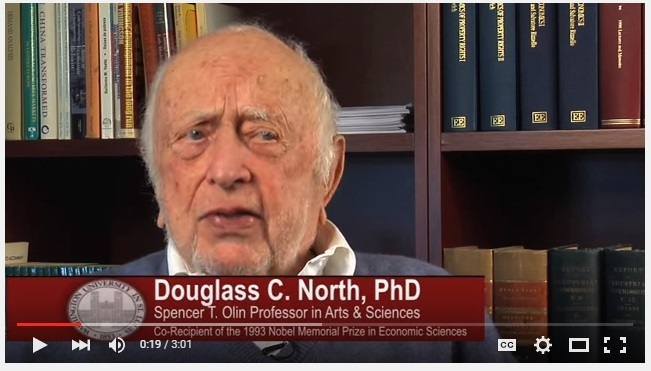 (Bloomberg) — Douglass North, who won a Nobel Prize for his studies of how political, social and other noneconomic forces shaped the economic growth of nations throughout history, has has died. He was 95. He died Nov. 23 at his residence in Benzonia, Michigan, according to a statement on the website of Washington University in St. Louis, where he was professor emeritus. The Royal Swedish Academy of Sciences awarded North and University of Chicago economist Robert Fogel the 1993 Nobel in economics “for having renewed research in economic history by applying economic theory and quantitative methods in order to explain economic and institutional change.” Both men were pioneers in applying modern mathematics to the study of history, a field known as new economic history, or cliometrics, after Clio, the muse of history in Greek mythology. North focused on the role of institutions — the rules and conventions of a society, such as laws, property rights, insurance, politics and customs — in long-term economic development. In a 1968 article, he argued that improved productivity in ocean shipping from 1600 to 1850 was due more to organizational changes — the rise of international trade and the drop in piracy, which reduced insurance costs and the need for manpower and armament — than to technological innovations, such as faster ships. That paper became “one of the most quoted research works in economic history,” the Nobel organization said in announcing North’s award. North was a professor for 15 years at the University of Washington in Seattle before moving in 1983 to Washington University in St. Louis. There, he founded the Center in Political Economy, which he directed until 1990. Douglass Cecil North was born on Nov. 5, 1920, in Cambridge, Massachusetts, the youngest of three children. His father was a manager at Metropolitan Life Insurance Co., and for his work, he moved his family to Connecticut, then to Ottawa, where his youngest son began school. He also attended classes in Lausanne, Switzerland, before completing high school at the Choate School in Wallingford, Connecticut, now called Choate Rosemary Hall. At the University of California-Berkeley, North became “a convinced Marxist” while majoring in political science, philosophy and economics, according to Nobel autobiography. Not wanting “to kill anybody” during World War II, he joined the U.S. Merchant Marine after graduating in 1942 and became a navigator on Pacific Ocean routes. Choosing economics over his other passion, photography, North returned to Berkeley for graduate studies, hoping “to find out what made economies work the way they did or fail to work.” He earned his Ph.D. in 1952 with a dissertation on the history of life insurance in the U.S.
Much of his later career would focus on developing such tools. He also delved into cognitive science to weigh how people make choices that lead to economic change. At Washington University in St. Louis, North founded the Center in Political Econony. With Ronald Coase, who won the economics Nobel in 1991, North created the International Society for the New Institutional Economics in 1997. North and his first wife had three children: Douglass, Christopher and Malcolm. He married Elisabeth Case in 1972.